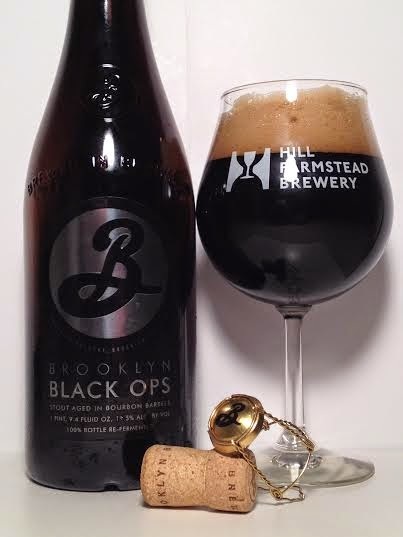 Black Ops is Brooklyn's Black Chocolate Stout aged for four months in bourbon barrels and re-fermented in the bottle with champagne yeast. I am a big fan of the Black Chocolate Stout, so I hope the barrel-aging has brought this to a new level. Pours as black as its name. I can't even get ruby red on the edges. How much more black could it get? The answer is: None. Got a decent amount of mocha head on the pour. Believe it or not, the bourbon is not the dominant aroma as I had hoped. As I stuck my nose into the glass I get the faint hint of the champagne yeast, but the alcohol stings the nostrils. A slight roasted malt presence, but the bourbon is practically non-existent nor is the chocolate of the base beer. I don't know what's going on with this beer. This is supposed to be barrel-aged Black Chocolate Stout, but there is no bourbon or chocolate to speak of. Instead I get a very slight roasted presence, but it is so watered down and thin that my taste buds are dying to grab hold on to anything, but it's just not there. For the style, it doesn't coat the mouth and it's not thick and fluffy. I just..I just don't know. I was expecting the Black Chocolate Stout to be brought to an almost elite status with four months of barrel aging, but those dreams were stomped on. There is no bourbon or chocolate on the aroma or taste. If this was a blind taste test, I'd swear this was a generic American Stout. How can barrel aging an already delicious stout make the beer worse? Well, Brooklyn Brewery has done it. Not only is it disappointing, but this beer will run you $25+ dollars. It is absolutely not worth the price tag. That being said, I can drink and finish it, but is that really a compliment? As a generic stout, the alcohol is too present. As a barrel-aged offering, it is more than a letdown. If you're sitting on one in your cellar, just drink it now as it's not worthy of a special occasion.